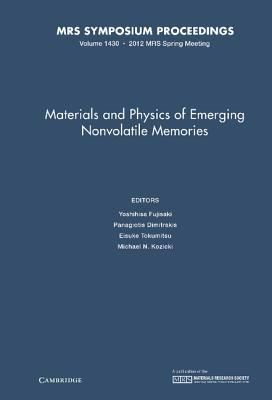 Symposium E, Materials and Physics of Emerging Nonvolatile Memories, was held April 9 13 at the 2012 MRS Spring Meeting in San Francisco, California, which was a follow up of previous symposia on nonvolatile memories. In this year's symposium, 127 papers were presented in 11 sessions, including 17 invited talks, 53 oral and 57 poster contributions. Such a large number of paper submissions and high attendance in the symposium indicate continuous strong interest and worldwide research efforts in the field of nonvolatile memories. Main research areas featured in Symposium E were advanced flash and nanofloating gate memories, ferroelectric and magnetoresistive memories, organic and molecular memories, memristors and resistive switching memories, and phase change memories. In particular, a large number of contributions were presented on resistive switching memories. The selected papers in the proceedings volume have been categorized in these areas.